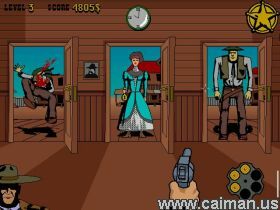 Caiman free games: Westbang by Pavel Tovarys and Frantisek Chmelar. Westbang is a revamped remake of an old 8-bit game of the ZX-Spectrum, also made for the Commodore 64. It starts off with a nice intro movie and storyline. You arrive as the new Sheriff, an unknown man into a lawless town. Will you become a ledgend ? only if you succeed the carnage in the final fight. 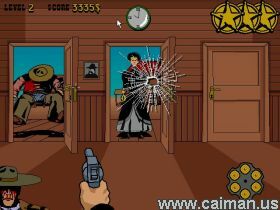 Save the bank from the bad guys and the wages for the workmen from the biggest railway company in the Wild West $500 000. Meet over 20 characters face to face, hordes of cheap street roughnecks or lone quick proffesional killers. Just remember, don`t shoot the good guys, and some of them you will have to wait until they draw their guns to shoot. Great menu`s, intro, sound`s and gameplay, a wonderfully remade, revamped game. This game has animated violence and adult language.